Pension-age suburbanite Frank Moses (Bruce Willis) wakes up to a volley of fire from masked hitmen, and as he deals with them one by one, realises his retirement is going to take a violent detour. The title stands for ‘retired, extremely dangerous’, and this knockabout action comedy is a boisterous, getting-the-band-back-together movie as Frank assembles a crew of trigger-happy oldsters (John Malkovich, Morgan Freeman, Helen Mirren, Brian Cox) to uncover why his distinguished, black-ops past is coming back to haunt him. It’s a charming mess, rescued by the knowing gusto of the acting. Beneath its light exterior is not only a neat, if unsubtle, political undercurrent but a rebellious streak about how the allure of firing an RPG outweighs the prospect of retirement. Red is now available on Netflix, it is an action, comedy, thriller mash-up that does not take itself too seriously. It has a very famous cast headed by Bruce Willis, Mary Louise Parker and Morgan Freeman. 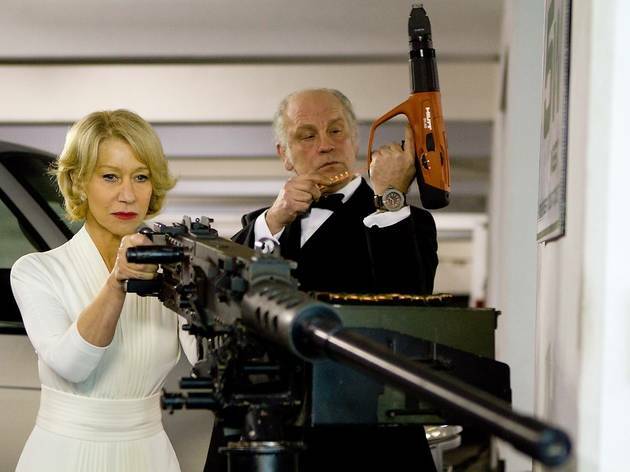 For me John Malkovich and Helen Mirren steal the show though with great off the wall characters brilliantly portrayed. Right through the cast are big names and all look like they are enjoying themselves immensely. The movie is an over-the-top version of the over-the-top 1990s action films, where it more about the guns, the explosions, the car chases and the banter than the story. The story is particularly ridiculous here and it really does not matter because it has the other elements in spades. Reds is very knowing in that it pokes fun at all the clichés of the time while blatantly using them. It has likeable characters and clever direction. Expect lots of bullets, lots of bangs and some good laughs along the way but don't expect any great philosophical insights. Personally, I thoroughly enjoyed it. Nominal comedy about the CIA with US flags and bullets all over the place and a cast of establiishment hacks trotting it out and raking it in, with a 'politcal undercurrent' worthy of critical mention, apparently? Some people dont realize that certain movies are meant to be watched by certain people..if you dont like this kind of movie then go and watch the movies of your choice..i for one am a big fan of Bruce Willis. I have watched every movie of his and have been satisfied. This movie is a funny and action filled movie about retired CIA and Black Ops agents who had to come out of retirement to save themselves from being murdered. Its a movie. Not a Reality TV show. I like these kind of movies. Doesn't mean i will learn from it and join the CIA or go commit a crime. I just like the storyline and action in this movie. it was really good so all you haters you should have watched better or you were just unlucky when God was handing out taste!!!!! LOVED IT ABSOLUTELY HILARIUOS!!! After the letdown of 'The Social Network' I needed a good laugh! Great movie, really enjoyed it! It's not a serious film, yet some people treat it as one! If you like action and a bit of fun, then get this and 'The Expendables'! Great casts too! Reminded me of the Bourne Identity on Prozac, a comedy caper without anything funny in it, thoroughly boring after the third shoot 'em up, the only amusement I got from this was looking for the many continuity errors, just check out Brucie's amazing mobile facial wounds if you want something to do until it thankfuly finishes. I really loved this film, one of the best I have seen in ages. After reading reviews I was reluctant to go an see it but decided that films with Bruce Willis or Morgan Freeman never dissapoint, and this one certainly didn't. Fantastic action, great humor, and a wonderfull range of actors. Definitely worth seeing. Somewhere - under the mountain of spent bullet shells - thereâ€™s the not bad idea of a film hidden away in here. But the executionâ€™s poor. In the way the chemistry of a collection of seasoned actors can work, here it doesnâ€™t, which is a shame as I like most of them. Great film if you donâ€™t want anything too taxing. Bad choice if you get bored easily. Two stars. Capable action caper which doesn`t take its self at all seriously. Lots of fun in a very silly piece of Hollywood Hookum. The film is made good rather than dreadful by the inspired cast enjoying themselves. Best turns come from Messers Malkovich, Cox and wonderful Ms Mirren. If you are looking for enjoyabke brainless entertainment you will love this. Ugly movie again repeating the lie that kiiling people and engagng in violence is a fun career choice. These great actors should be ashamed to add their names to such ugly attitudes just to make more money and keep in the public eye.